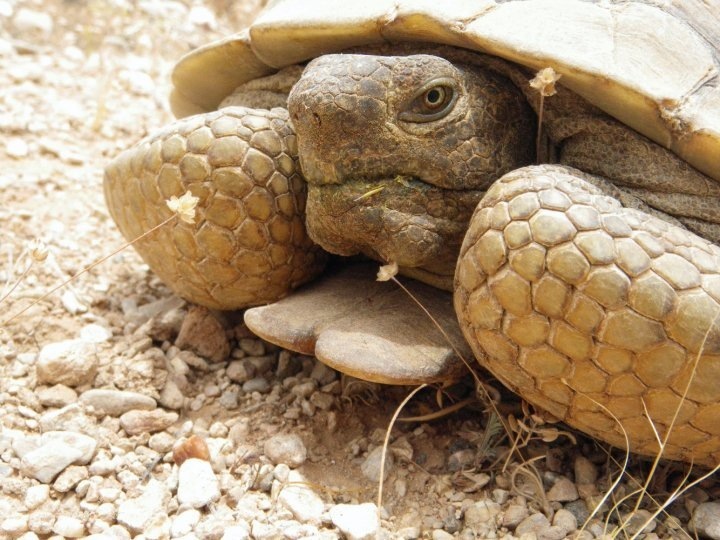 An understanding of wild tortoises, such as this wild adult male Agassiz’s desert tortoise, can give keepers of captive tortoises great insight into the lives of their pets. Photo by Michael Tuma. Tortoises are in the family Testudinidae, one of 14 turtle families, and represent the only turtle family that is completely terrestrial. They exhibit a number of morphological and physiological adaptations that have allowed them spread to almost every continent on the planet and evolve to persist in a wide variety of terrestrial habitats and ecological conditions. These adaptations include heavily scaled limbs and heads that provide protection against predation and water loss; strong, elephantine limbs to support their bodies during terrestrial locomotion; stout, un-webbed toes adapted for walking and digging; and a specialized urinary bladder that allows them to store water for metabolic processes. The Testudinids are most closely related to Geoemydids, a family of mostly aquatic and semi-aquatic turtles that are primarily distributed in Asia. Tortoises probably evolved in Asia during the Paleocene Epoch (66-56 million years ago) following the mass extinction that characterized the terminal Cretaceous Period. The absence of more than three-quarters of life on the planet, including all of the non-avian dinosaurs, created ecological opportunities on Earth’s renewed landscapes for the evolution and spread of new species, including tortoises. The earliest described tortoise is Hadrianus, a species that originated in Asia about 50 million years ago during the Eocene epoch. Hadrianus, which is very closely related to the extant Manouria, was a very successful, widespread species with fossils known from Asia (Crumly 1983; Danilov and Averianov 1997), North America (Auffenberg 1974), northern Africa (Andrews 1906), and Europe (de Broin 1977; Mlynarski 1955; Schleich 1981). A Miocene-aged fossil of Ergilemys (=Hadrianus) insolitus from Russia. Photo by Pavel Bochkov. The descendants of Hadrianus diversified during the Miocene Epoch and climaxed in numbers of species during the Pleistocene. 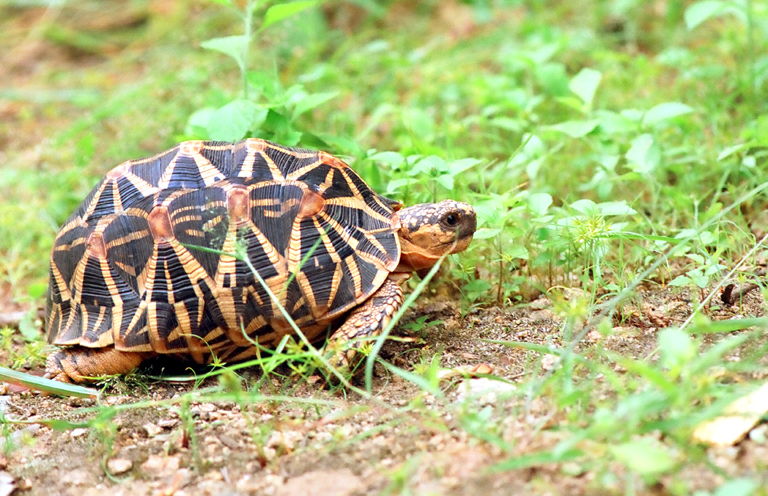 Today’s tortoises include at least 52 recognized species and 25 subspecies distributed among 16 genera (van Dijk et al. 2014). Their success is measured by their occurrence on nearly every continent; in fact, they exhibit the widest geographic distribution of non-marine turtle families. However, modern tortoises represent just a fraction of their Pleistocene relatives. The evolution and spread of humans across the planet spelled the first (and likely the last) major threat to tortoises. Tortoises provided an easily-harvested, high-nutrient source of food for humans, and many tortoise species did not survive in the face of this new threat. Several species of giant tortoises became extinct by the Pleistocene/Holocene transition, including the central Asian Megalochelys, which was the size of a Volkswagen Beetle, and five North American species of Hersperotestudo, relatives of the modern Gopherus tortoises. More recently, the actions of humans caused the extinction of numerous, giant, island-dwelling tortoises, including several species of Aldabrachelys, all of the giraffe-necked giant tortoises (Cylindrapsis sp. ), and several species of Galapagos giant tortoises (Chelonoidis sp.). Humans continue to push other tortoise species to the brink of extinction, and currently tortoises are one of the most endangered groups of animals on the planet (Rhodin et al. 2011). There are a number of critically endangered African and Madagascan tortoises that may go extinct in the wild within our lifetimes due to the actions of humans, including the radiated tortoise, ploughshare tortoise, spider tortoise, and flat-tailed tortoise from Madagascar, and the newly described Nama padloper and the geometric tortoise from southern Africa. A number of critically endangered Asian tortoises may also become extinct in the wild very soon, including the elongated tortoise, Forsten’s tortoise, the Asian giant tortoise, the Burmese star tortoise, and the impressed tortoise. Two additional species – the bolsón tortoise of Mexico and the Egyptian tortoise of northern Africa – are also critically endangered and at high risk of soon becoming extinct in the wild. There are three major threats to wild tortoise populations. First and foremost is habitat destruction, one of the most influential agents of human-induced global change. As habitat is erased or degraded, tortoise populations are squeezed into smaller and more isolated patches of habitat, hastening their demise. Human consumption of tortoises, a phenomenon that began in the Pleistocene and continues today, is a huge problem that has decimated a number of tortoise species, leading to local population extirpations, and threatening to drive certain species to extinction. Finally, collection of wild tortoises for the pet trade has had devastating effects on tortoise species, and is rapidly driving several species towards the brink. As keepers of pet tortoises, we must and need to be aware of the potential impacts that our actions have on wild tortoise populations and their future persistence. For better or for worse, pet tortoise keepers have a large influence on wild tortoise populations, and our actions can contribute to their demise or success. First and foremost, keepers of pet tortoises should strive to conserve wild populations and tortoise diversity to the extent possible. There are a number of ways that pet tortoise keepers can do this, the easiest being joining or contributing to conservation groups that work to conserve wild tortoise populations, such as the Turtle Conservation Fund, Turtle Survival Alliance, and the Desert Tortoise Council, to name a few. Another significant way pet tortoise keepers can contribute to conservation efforts is by ensuring that they acquire their pet tortoises only from reputable breeders who offer captive bred stock. Collection of wild tortoises for the pet trade is not a sustainable practice, and will only serve to deplete wild populations. Without viable wild populations, laws will become more restrictive for owning and transporting pet tortoises. So it is in our best interest as tortoise keepers to eliminate the need for the collection of wild tortoises for the pet trade by not purchasing them. Finally, pet tortoise owners who breed their tortoises may be in a position to keep those species from going extinct. 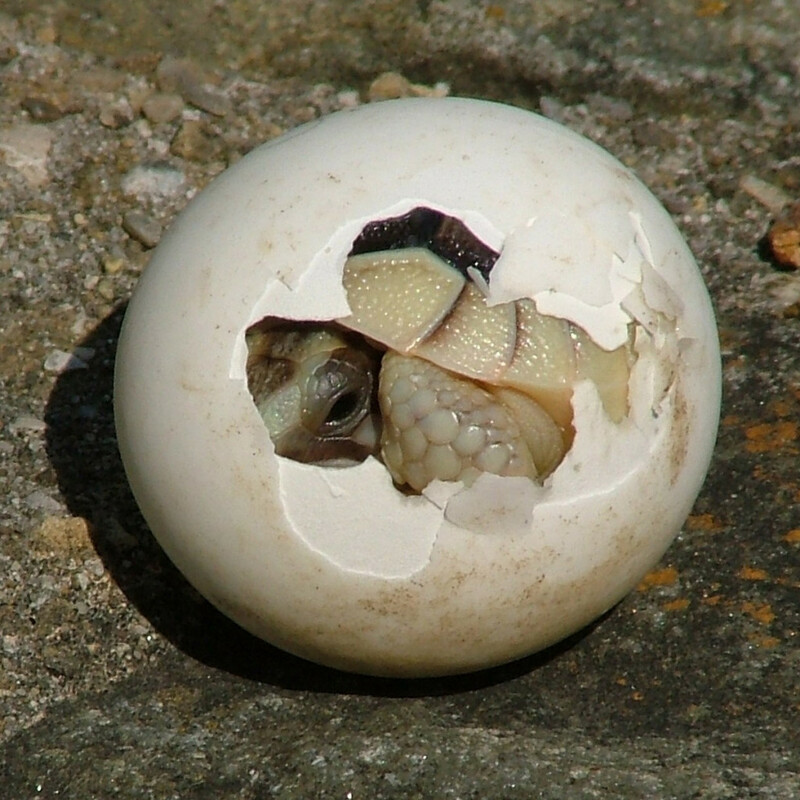 Captive tortoises may provide a valuable genetic reservoir for reintroduction and repatriation efforts, and professional captive breeding programs are already being implemented for Galápagos tortoises, bolsón tortoises, and Burmese star tortoises. As wild tortoise populations are driven closer and closer to extinction, keepers who breed captive tortoises may be in a position to contribute to these conservation programs. Breeders of captive tortoises who wish to contribute to these conservation efforts should strive to maintain the genetic diversity of locality-specific populations, and should avoid inbreeding to produce designer pets, such as albinos and ‘hypo’ morphs. Purchase of captive-bred tortoises ensures that wild populations are not affected by collection for the pet trade. Photo by Richard Mayer. Andrews, C. W. 1906. A descriptive catalogue of the Tertiary Vertebrata of the Fayum, Egypt. London: Trustees of the British Museum. Auffenberg, W. 1974. Checklist of fossil land tortoises (Testudinidae). Bulletin of the Florida Museum of Natural History 18(3):121–251. Crumly, C. R. 1983. 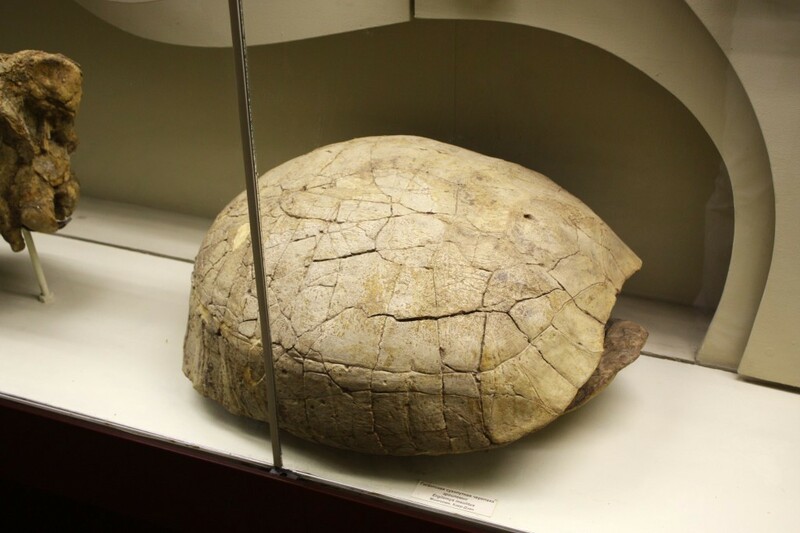 An annotated checklist of the fossil tortoises of China and Mongolia. Proceedings of the Biological Society of Washington 96:567–580. Danilov, I. G. and A. O. Averianov. 1997. New data on the turtles from the early Eocene of Kirghizia. Russian Journal of Herpetology 4(1):40–45. de Broin, F. 1977. Cheloniens continentaux du cretace et du tertiare de France,” Mémoires du Muséum National d’Histoire Naturelle C38:1–366. Mlynarski, M. 1955. Zolwie zu Pliocenu Polski. Acta Geologica Polonica 5(2):161–214. Rhodin, A. G. J., A. D. Walde, B. D. Horne, P. P. van Dijk, T. Blanck, and R. Hudson. 2011. Turtles in Trouble: The World’s 25+ Most Endangered Tortoises and Freshwater Turtles—2011. Turtle Conservation Coalition (IUCN/SSC Tortoise and Freshwater Turtle Specialist Group, Turtle Conservation Fund, Turtle Survival Alliance, Turtle Conservancy, Chelonian Research Foundation, Conservation International, Wildlife Conservation Society, and San Diego Zoo Global). Lunenburg, Massachusetts. 54 pages. Schleich, H. H. 1981. Jungtertiäre Schildkroten Suddeutschlands unter besonderer Berucksichtigung der Fundstelle Sandelhausen. Courier Forschungsinstitut Senckenberg 48:1–372. van Dijk, P. P., J. B. Iverson, A. G. J. Rhodin, H. B. Shaffer, and R. Bour. 2014. Turtles of the World, 7th Edition: Annotated Checklist of Taxonomy, Synonymy, Distribution with Maps, and Conservation Status. Chelonian Research Monographs 5:329–479.